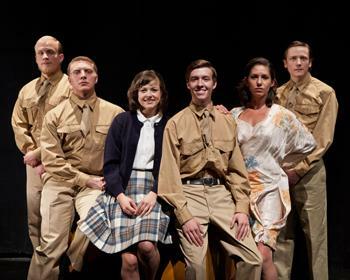 The Kohlenberg Lyceum Series continues Feb. 20 with Neil Simon’s play “Biloxi Blues” to be performed by the Montana Repertory Theatre at 7:30 p.m. in Baldwin Hall Auditorium. The Montana Repertory Theatre will perform “Biloxi Blues” Feb. 20 in Baldwin Hall as part of the Kohlenberg Lyceum Series. Tickets are free for students, faculty and staff. Tickets will be available free of charge for students, faculty and staff starting Feb. 13. Students may pick up their tickets at the Student Activities Board Office in the Student Union Building. Faculty and staff may acquire their tickets at the information desk in the Student Union Building. General admission tickets cost $7 and are available at the Truman Cashiers Window in McClain Hall or on the square at Edna Campbells. Tickets may also be purchased online at lyceum.truman.edu. For additional information, visit lyceum.truman.edu or contact 660.785.4016. The Global Issues Colloquium will continue at 7 p.m. Feb. 14 in Magruder Hall 2001 with a presentation by Dennis Quinn, professor with the McDonough School of Business at Georgetown University. For complete details about Global Issues Colloquium events, including abstracts of upcoming presentations, visit globalissues.truman.edu. Former Secretary of the Department of Housing and Urban Development Alphonso Jackson will be on campus Feb. 8-9 to dedicate a personal collection of artifacts to Truman and to share his experiences with the campus community. Jackson, a University alumnus, served with the Bush Administration from 2004-2008 as Secretary of Housing and Urban Development. Prior to this appointment, he served as deputy secretary and chief operating officer of Housing and Urban Development from 2001-2004. Upon leaving HUD in 2008, Jackson became the director of Hampton University’s Center for Public Policy and Leadership, a position he held until 2012. Currently, Jackson resides in New York City and is the vice chairman of mortgage banking for JP Morgan. After graduating from the University with a bachelor’s degree in political science in 1968 and a master’s degree in education administration in 1969, Jackson continued his education at Washington University where he obtained his juris doctorate. His time at Truman, then known as Northeast Missouri State College, had a significant impact on Jackson, who remembers fondly the education and guidance he received. In particular, Kenneth Gardner, track coach and athletic director, 1951-1988, was instrumental in mentoring Jackson, who would go on to serve the country during events such as the September 11, 2001 attacks on the nation and Hurricane Katrina. Jackson continued his relationship with Truman in later years, providing leadership to his alma mater by serving on the Board of Governors from 1994-2001. 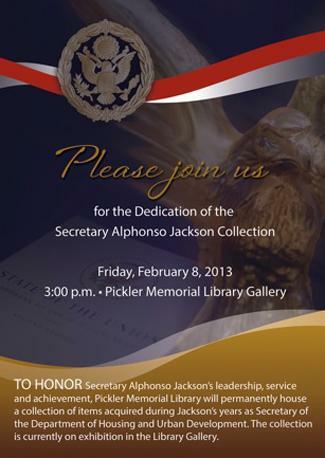 To honor Jackson’s leadership, service and achievement, Pickler Memorial Library will permanently house a collection of items acquired during his years in HUD. Jackson and his wife Marcia will be in attendance for a dedication ceremony at 3 p.m. Feb. 8 in the Pickler Memorial Library Gallery. The Secretary Alphonso Jackson Collection is currently on exhibition and is open to the public for viewing in the Library Gallery until Feb. 22. Taxpayers should be sure to bring proof of identity; copies of all W-2, 1098, 1099 forms and any other tax forms received in the mail; social security cards for all individuals listed on the tax return; and banking information if a direct deposit is desired. For more information, call 660.785.4378. Truman State University Foundation scholarship applications for 2013-2014 are available now. Applications are due by midnight March 1. To apply, log into TruView and look on the Student tab under the Student Finances channel. There is a new simplified application process this year designed to help students identify those scholarships for which they are most qualified. See the Helpful Hints and Guidelines for more information. These scholarships are available thanks to the generosity of alumni and friends of Truman State University. Graduating seniors have the opportunity to recognize a high school educator/counselor whom they feel made a positive impact on their academic growth. The selected teacher/counselor will be invited to be formally recognized and participate in spring commencement and a $1,000 scholarship in their honor will be awarded to an incoming Truman student from their high school. Those graduating seniors that would like to make a nomination can do so at giving.truman.edu/teacherrecognition. The nomination deadline is Feb. 8. The School of Health Sciences and Education (SHSE) Dean’s Team will kick-off the Eat, Listen and Learn lunch series at 12:30 p.m. Feb. 11 in Magruder Hall Room 2001. Jeremy Houser will serve as the inaugural luncheon speaker. Houser is an associate professor of anatomy at A.T. Still University and was formerly an associate professor of health and exercise science at Truman. The Dean’s Team promises a riveting lecture while students relax and enjoy their lunch. Students must bring their own lunches to the lectures. Check out the new trends in business wear and learn how to dress professionally for your next interview or job fair. Stop by one of the locations listed below to have your resume critiqued before Career Week! Enjoy a four-course meal and learn about proper etiquette for business interviews and meals. Register at the Career Center or online at career.truman.edu. Alpha Phi Omega will be hosting a Red Cross blood drive from 10:30 a.m.-5:30 p.m. Feb. 6-7 in the Student Union Building Georgian Room. Donors are encouraged to sign up at tables in the Student Union Building or McClain, Missouri, Ryle and Magruder halls or at redcrossblood.org. Walk-ins are always welcome. Stop by to get your resume critiqued before Career Expo! Come view an inspirational documentary about finding passion and wisdom to fulfill your dreams followed by a “Chase Your Dreams” workshop led by the creators of the documentary. Visit with local non-profits to find out what they do and how you can help. Representatives from various local organizations will be available to talk with students about their work and give students the chance to volunteer with the current projects. Interested in non-profit careers? Join us for our annual Non-Profit Conference where you will learn more about working in the non-profit sector including full-time employment, internships, volunteer experience and more. This is an interactive conference composed of a keynote speaker, dinner and interaction with 10 table hosts representing different fields of the non-profit sector. Pre-registration is required as there are limited spaces available. Evetos will be giving a presentation about why internships are necessary and useful for your future. Think you might be interested in publishing? Learn about careers in this field from Loren Kreher who works at the Denver Publishing Institute. Students will be able to learn what a publishing career looks like, and they can ask specific questions. Total Quality Logistics presents what happens on the employer side, how to follow up, what they can do to research, preparations for on-campus interviews the following day, and what to expect with interview processes. Truman volleyball coach Ben Briney and his staff and players will be hosting a series of winter clinics this February and March in Pershing Arena. Volleyball players ages 5th-grade and older can receive 1-on-1 and group instruction on all fundamental skills with a high amount of individual feedback. Remaining sessions will take place from 1-3 p.m. Feb. 9, 16, 23 and March 3, 9. Cost is $15 per session. For more information, contact assistant coach Megan Wargo-Kearney at 660.785.7751 or mwargo@truman.edu. Walk-ups are welcome. 2012 Homecoming Apparel is now available at reduced prices. Supplies and sizes are limited. Purchases can be made from 8 a.m.-5 p.m. in McClain Hall 205. Cash or check only. For more information, contact Denise Smith at 660.785.4174 or dlsmith@truman.edu. Wondering What is New in the Library? All sessions take place from 12:30-1:20 p.m. in Pickler Memorial Library 103 unless otherwise stated. This session will focus on two GoogleApps used at Truman: Google Docs and Google Sites. Learn how wikis like Google Docs can be used in the classroom to facilitate deeper learning. Spend time creating a free and easy website using Google Sites that can be shared with students to help them stay connected outside of the classroom. Join ITS staff members to learn more about the many features of the Multimedia Lab in the Library. From Adobe Captivate and Photoshop to iMovie and GarageBand, the Multimedia Lab offers special software for use in education. The workshop will begin in Pickler Memorial Library 103 with a brief presentation of available software, then the workshop will move to Pickler Memorial Library 204 for a brief orientation of how the room is used. MOOCs (Massively Open Online Courses) are getting a lot of attention in higher education these days. Will they change the landscape of higher ed in the future, or will they wind up being a lab experiment from which we can learn? Professor Shirley McKamie will share her personal experience from the perspective of a student in a MOOC to learn more about the experience of participating in one. This workshop will discuss the use of EyeJot to provide feedback to students in a more personal way. Participate hands-on and learn how to create feedback using text, voice and video to improve online communications. The Truman State University Digital Library features digitized objects from the holdings of the Pickler Memorial Library Special Collections and University Archives. These include manuscripts, photographs, glass slides, vintage sheet music and other unique and rare items. Amanda Langendoerfer, head of Special Collections and Archives, along with Janet Romine, head of Public Services, will explain and demonstrate how to access these rare finds. Romine will also touch on the Library’s eBrary and Films on Demand that can be accessed and utilized as resources with students. Blackboard is a robust Course Management Tool that allows instructors to not only create and share content, but to design it in such a way that students are motivated and engaged with the content. This workshop will be helpful for instructors that already use Blackboard but would like to learn more about the use of special features such as Adaptive Release, Customization and Learning Modules. Addressing the special needs of students with disabilities is important to their success. Vicky Wehner from Disability Services will discuss the importance of universal design and what options are available to help students with disabilities to improve their learning outcomes. This session will demonstrate some of the more advanced features of the SMARTBoard. Learn how to work with these tools to create innovative and interactive activities in the classroom to increase successful learning outcomes and provide an engaging experience. The final workshop in the series will focus on sharing additional free tools that can be used such as Prezi and StumbleUpon. For complete coverage of all Truman sports, visit trumanbulldogs.com. Hy-Vee Foundation Scholarships are now available at hy-vee.com under company info. Forty $1,000 scholarships will be given to college students for the 2013-2014 academic year. Applicants: must have been employed at a Hy-Vee location after June 1, 2012; must be classified as a full-time student in their freshman, sophomore or junior year during time of application process; must be classified as a full-time sophomore, junior or senior at the time funds are disbursed. Deadline for application is Feb. 10. Federated Garden Clubs of Missouri has scholarships available for the 2012-2013 academic year. Last year more than $10,000 was awarded to Missouri students. Winners in Missouri are also eligible for the Central Region and National scholarships. Missouri students have received these prestigious awards the last three years. For further information and applications, go to www.gardenclub.org/scholarships. Deadline for receiving applications is March 1. The Missouri Insurance Education Foundation will award scholarships to deserving students attending Missouri colleges or universities in a program that could lead to positions in the insurance industry in Missouri. The C. Lawrence Leggett Scholarship in the amount of $2,500 is to be awarded to a junior or senior Missouri resident majoring in insurance or a related area of study in a Missouri college or university. In addition to the Leggett Scholarship, the foundation has made an additional scholarship available in the amount of $2,000. Application forms are available at mief.org. Applications are due by March 31. Marine Technology Society (MTS) is offering scholarships to undergraduate and graduate students who are studying in the marine science, marine engineering and/or marine technology field. Scholarships are for MTS student members only. For membership information, go to mtsociety.org/membership/new/add.aspx. Student membership is for full-time college students and high school seniors and is only $25 per year. Applications must be postmarked no later than April 15. Contact suzanne.voelker@mtsociety.org with any questions. MassMutual Financial Group is offering high-achieving college students of African-American, Asian/Pacific Islander or Hispanic descent, interested in pursuing careers in the insurance and financial services industry, a scholarship opportunity for the 2013-14 academic year. For eligibility criteria, go to act.org/massmutual. Application deadline is May 3. The Jack J. Isgur Foundation is a Missouri not-for-profit corporation formed for the purpose of promoting an interest in the field of education in the humanities, such as literature, fine arts, music, art, poetry and dance. The foundation awards scholarships to students studying at colleges and universities who indicate an interest in teaching courses in the above-described areas in school districts located in the State of Missouri, preferable rural school districts. It is available to those at the junior and senior levels of undergraduate college, as well as graduate students. For more information and to obtain an application for this scholarship, go to isgur.org. Deadline is May 15. The creators of the “Student Award Search Aid” website are renewing the B. Davis scholarship for 2013. For more information on this $1,000 scholarship, visit studentawardsearch.com/scholarships.htm. Questions can also be sent to awards@studentawardsearch.com. Deadline to apply is May 27. The CEO of Tomorrow Scholarship is a $2,500 scholarship for students interested in business leadership and/or entrepreneurship. Applicants must answer a short online survey and submit a 500-1,000 word essay on “the CEO of tomorrow.” Possible topics could include (but are not limited to) company structure, company culture or utilization of technology. For more information, or to apply, go to ceo.com. Deadline is July 1. Abbott & Fenner Business Consultants will be awarding up to $1,000 each year to a scholarship winner. To apply students will submit an essay on the topic that appears on the scholarship page of their website at abbottandfenner.com/scholarships.htm. An original musical composition by Edwin Fattig, Truman music composition graduate student, has been selected for performance at the 2013 University of Nebraska-Kearney New Music Festival. The composition, entitled “Lur,” will be performed Feb. 11 by Luis Viquez, Truman music clarinet performance graduate student. Truman music student Jon Ginder won first place in the young artist division of the Music Teachers National Association (MTNA) National Composition Competition. For winning the competition, Ginder will receive $3,000 from the MTNA Foundation Fund and his composition, “Large Angry Chicken,” will be performed at the MTNA National Conference March 9-13 in Anaheim, Calif., by members of the Truman Clarinet Ensemble under the direction Luis Viquez, Truman music clarinet performance graduate student. Daniel Mandell, professor of history, spent two weeks as a visiting scholar at the Princeton Institute for Advanced Study, with the School of Social Science. He participated in various seminars and discussions, and presented a piece of his new project at an afternoon workshop. Steve Smith, professor of business administration, and Bryce Jones, professor of business administration, had their manuscript entitled, “The SEC and Corporate Governance” accepted for publication in the Journal of Leadership, Accountability and Ethics. The Truman State University Wind Symphony, under the direction of conductors Dan Peterson and Thomas Trimborn, performed for the Missouri Music Educators Association Jan. 26 at Tan-Tar-A Resort in Osage Beach, Mo. The Truman State University American Marketing Association is helping market CDs to help support a fellow Truman student, Colin Hart, whose father passed away. The two CDs, Be Still My Soul and King of Kings, were created by Harts on Strings, Inc., a band made up entirely of Colin’s family members in memory of their father who instilled in the family a strong love of classical music and hymns. The CDs are available through the American Marketing Association for $15 each. To purchase one or both of the CDs, email Jenny Roe at jar1138@truman.edu or Shelby Morton at sem2748@truman.edu. Donations made out to Truman AMA can be and sent to the attention of Datha Damron-Martinez in Violette Hall 2456. The Center for International Education Abroad will conduct a Spring Study Abroad Fair from 10 a.m.-3 p.m. Feb. 5 in the Student Union Building Activities Room. The Study Abroad Fair provides an opportunity for students interested in studying abroad to speak with advisers, faculty members, program directors and students who have previously studied abroad. There will be a raffle, food and refreshments. The Physics Colloquium will continue at 4:30 p.m. Feb. 6 in Magruder Hall 1096 with a presentation by Markus Wohlgenannt from the University of Iowa Department of Physics and Astronomy. Match Education is seeking candidates to work as full-time, in-school, professional math tutoring fellows for the 2013-2014 school year in Lawrence, Mass. For more information on Match Education and how to apply, visit matcheducation.org. The A.I. Project, from AGSC 491, will available at 11:30 a.m. Feb. 9 in the Student Union Building Activities Room to offer tips and tricks for taking care of pets, livestock and exotic animals. The University Board of Governors will meet at 1:15 p.m. Feb. 9 in the Student Union Building Conference Room. Society for Sino-American Studies will host a Chinese New Year celebration from 6-8 p.m. Feb. 9 in the Student Union Building Georgian Rooms. Events include performances from different Asian cultures and authentic Chinese food. Admission is free. An open dodgeball session will take place from 7-10 p.m. Feb. 9 in Pershing Small Gym. Sponsored by Truman’s Pitlords of Dodgeball. Truman Live! talent show auditions will take place from 2-5 p.m. Feb. 10 in the Student Union Building Down Under. Participants must sign up in advance at sab.truman.edu. The talent show will take place March 1 in Baldwin Hall. The Quincy Symphony Orchestra will perform French Grandeur at 3 p.m. Feb. 10 in the Quincy Junior High School Morrison Theater. Admission is free with a Truman ID. Service Board Funding applications will be available online Feb. 11 at serviceboard.truman.edu. Applications for funding will be due by 5 p.m. March 29 in the mailbox located in the Student Involvement Complex in Student Union Building. Truman’s chapter of Phi Kappa Phi will sponsor a workshop to help students with abstracts for the Student Research Conference. The workshop will take place at 4 p.m. Feb. 12 in Magruder Hall 2005. Space can be reserved at doodle.com/yyt4adqmddizyazh. Phi Sigma Pi will be hosting spring rush events Feb. 17-20. For more information, visit the University Master Calendar or psp-beta.truman.edu. The American Association of University Professors (AAUP) will host its monthly meeting at 4:30 p.m. Feb. 19 at the University Club House, 516 E. Patterson. Contact Marc Becker at marc@truman.edu or call 785.6036 for more information. Abstracts for the Student Research Conference are due before 11:59 p.m. Feb. 22. All abstracts need to be sponsored by a Truman faculty or staff member and can be submitted online at src.truman.edu.